To register a store, you must first have a Yandex login. The owner of the login is the Main Contact for your store. Go to the address https://partner.market.yandex.ru/. You will be taken to the registration page on Yandex.Market. To switch to English, click at the bottom of the page. Start your Yandex.Market registration. Specify the contact information for the person who can be contacted about technical questions. Specify the country in which the store is located. If it is not Russia, Belarus or Kazakhstan, then the Delivery from foreign warehouses option will automatically be displayed, since it will be assumed by default that you will deliver goods from another country. 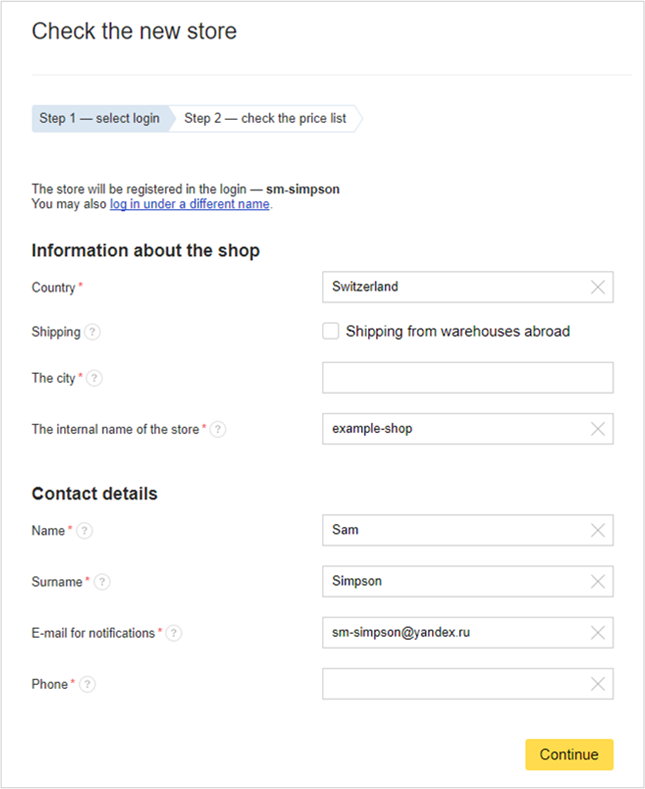 If your store has its legal address in another country but you intend to deliver orders from warehouses in Russia (or Belarus or Kazakhstan), then you can deselect this option. Click the Continue button to proceed to the next step.